YANGON -- Up to 69 members of what Myanmar's government has described as a Rohingya Muslim militant group and 17 members of the security forces have been killed in an escalation of fighting in ethnically divided Rakhine State, the army said on Tuesday. The death toll, announced in the state-owned Global New Light of Myanmar daily, was sharply higher than that reported by state media at the weekend, and came as former United Nations chief Kofi Annan, who chairs a commission on resolving Rakhine's problems, voiced concern at the upsurge in violence. It has exposed the tension between Nobel Peace Prize winner Aung San Suu Kyi's seven-month-old civilian administration and the army, which ruled for decades and retains key powers, including control of ministries responsible for security. "I wish to express my deep concern over the recent violence in northern Rakhine State, which is plunging the state into renewed instability and creating new displacement," said former UN Secretary General Annan in a statement. "All communities must renounce violence and I urge the security services to act in full compliance with the rule of law," he said. Members of the commission, set up by Suu Kyi in August, are in Rakhine for consultations with community members this week. They have locked down the district, where the vast majority of residents are Rohingya Muslims, shutting out aid workers and independent observers, and conducted sweeps of villages. A series of skirmishes and attacks during the six days to Monday had led "to the death of 69 violent attackers and the arrest of 234", the military's True News Information Team said. Ten policemen and seven soldiers were also killed in the clashes, it added. 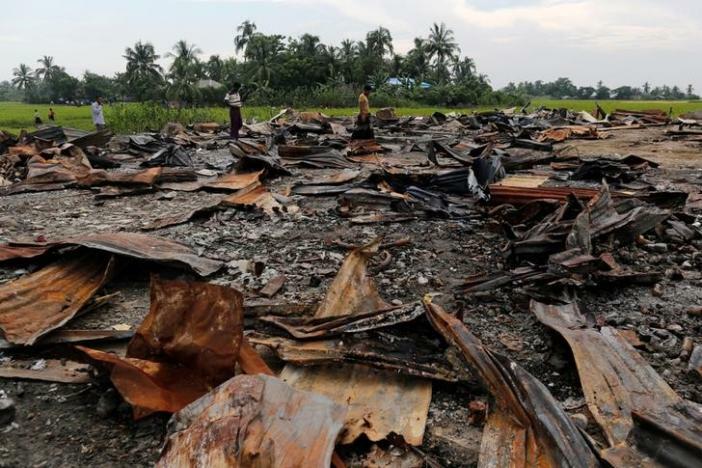 The announcement takes to 102 the tally of deaths of suspected Rohingya Muslim attackers since Oct. 9, while the security forces' toll stands at 32, based on reports in state-owned media. Myanmar's 1.1 million Rohingya Muslims are denied citizenship, with many of the country's majority Buddhists regarding them as illegal immigrants from Bangladesh. Top diplomats from the UN, Britain, the United States and several other countries traveled to the area in early November and said the government had agreed to the restoration of humanitarian aid. But only 7,200 people from four villages have received food, while regular aid convoys to the area have not been restored, according to the UN's humanitarian agency. "While this limited access is welcome, thousands of people remain in need of humanitarian assistance with up to 15,000 people displaced in the area of security operations," the UN Office for the Coordination of Humanitarian Affairs said in a statement. "Humanitarian services for more than 150,000 people have now been suspended for more than a month," it said. The government and army reject the accusations, blaming the "violent attackers" for razing houses.